Confession: I haven’t been on a roller coaster since high school, which was over ten years ago. I think that means I’m officially old. To be honest, even back then I wasn’t super into rides. I tried to keep up with my classmates during our senior trip to Cedar Point, but after a few coasters, I was ready to find myself some shade, a slushie, and a seat that didn’t move at 80 miles per hour. My husband, on the other hand, has always been a thrill seeker. He likes to get to the park early so he has plenty of time to ride all the rides and repeat his favorites. He can hop from one to the next without any issues, and without his stomach or head crying out for mercy. For the last few years, I’ve told him to find a friend to go to Cedar Point so he can get all of his high flying, zero gravity cravings met while I stay at home and get my adrenaline going with a riveting book. But this year Cedar Point was offering something a little different. Not the tallest coaster or the fastest acceleration, but something much more my speed: BBQ. Their annual Brew and BBQ is a foodie experience with live bluegrass music, beer, and tons of delicious smoked meat. Suddenly I really wanted to ditch my novel and go to Cedar Point again. My husband was able to take Friday off at the last minute, so we buckled up and headed towards Sandusky for a little adventure. I’ll admit, I was in it for the food, but I promised my husband I’d let my feet leave the ground at least once. The day ended up being dreary, rainy, and cold, but we still had a blast, and I even made good on my promise by riding the Merry Go Round…twice! Okay, okay, I know that doesn’t count, so just for good measure I also rode The Gatekeeper (which looked deceptively small and mild and turned out to be rather large and intense), and the Iron Dragon, which was just my speed (ie: a breezy 40 mph). Feeling pretty proud of myself, we headed to the back of the park to warm up and fill our bellies. Little did we know the feast that awaited us–BBQ of every kind (Nashville, Kansas, Texas, Carolina) and cut (ribs, brisket, pulled pork, nachos, sliders, sausages, and more). I also discovered Not Your Momma’s Iced Tea (amazing!) and indulged in some of the creamiest, dreamiest mac and cheese I’ve had in awhile. There’s not a classic creamy macaroni and cheese recipe anywhere on the blog, mainly because I’ve never found one worth sharing. I’ve eaten way too many awesome mac and cheese plates to settle for anything less than supremely creamy, rich, and cheddary noodles. But with summer BBQ season fast approaching, I decided it was past time for me to find my go-to recipe for mac. I did a lot of research on this one, learning about different types of cheese, the construction of the perfect bechamel, and what type of noodle to use. After much debate, I finally decided to try a recipe from the ladies behind Homeroom restaurant, an Oakland, CA eatery devoted entirely to macaroni and cheese. I’ve included their tips (as well as a few of my own), below! Start with a rich bechamel made with whole milk and plenty of butter. Warming the milk before adding it to the flour and butter mixture helps prevent it from clumping or breaking. 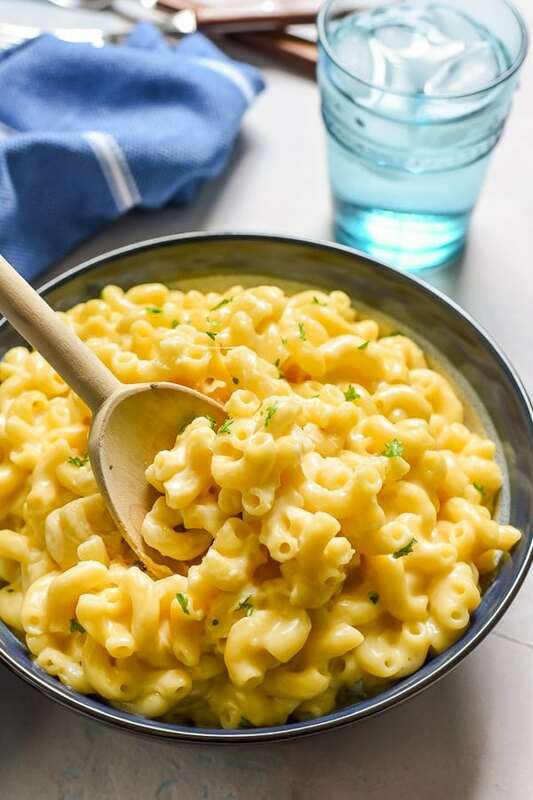 Use hearty macaroni noodles (the kind with ridges for soaking up sauce), and just slightly undercook them since they’ll continue to cook a bit in the warm cheese sauce. Use super flavorful cheese–I love the combination of aged sharp cheddar and a dry pecorino romano. 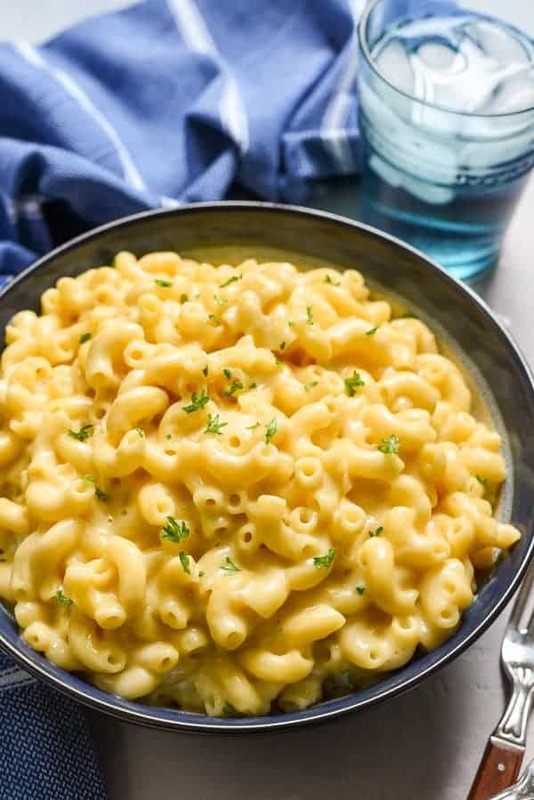 But, if you prefer a more classic, mild mac and cheese flavor, you can substitute in some American cheese or experiment with your favorite cheeses. 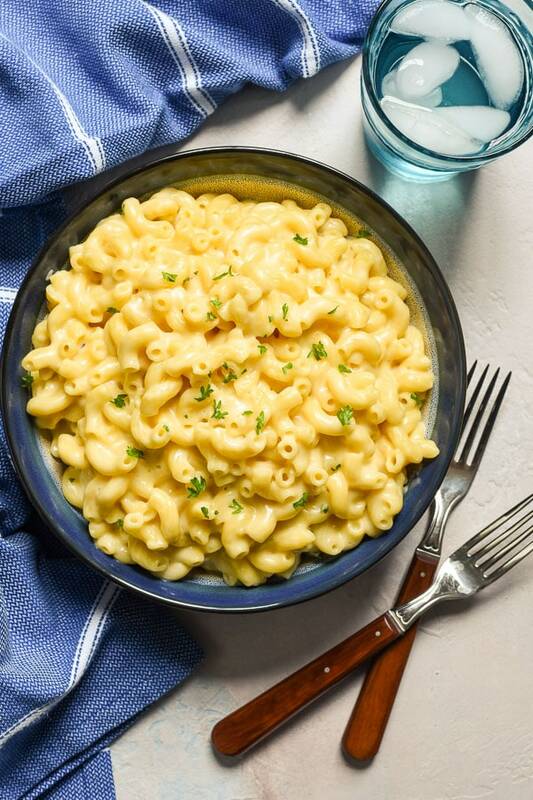 This is now my go-to creamy macaroni and cheese recipe. This is what I take to reunions and bake under breadcrumbs and serve up alongside BBQ ribs. It is creamy and oh-so-rich, with a really pronounced salty cheddar flavor. Of course, there’s plenty of room for customization here. Try pepper jack or chipotle cheese for a nice kick, or substitute some monterey jack or mozzarella for a milder flavor. You can stir in peas or hot dogs, jalapenos or broccoli. 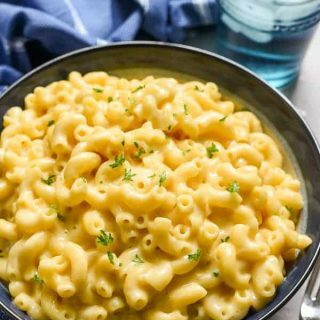 But if you’re looking for an awesome base recipe you can make for any occasion, this creamiest mac and cheese recipe is your guy. Update: This recipe has taken off on Pinterest! I’ve included a few reviews below. If you’re looking for more real-life reviews and pictures, check out this pin! This classic stovetop macaroni and cheese is extra creamy and rich with a great cheddar flavor. Cook the macaroni noodles in a large pot of salted water according to package directions, draining them a minute before the "al dente" cooking time. In a heavy bottomed sauce pot, melt the butter over medium heat. Whisk in the flour and continue to cook, whisking constantly, until the mixture turns a light brown color, about 3-4 minutes. Remove from heat. Slowly start pouring in the milk, whisking constantly. The mixture will look very thick at first and will thin out as you whisk in the remainder of the milk. Return the pot to the heat and cook the mixture, whisking continuously, another 3-5 minutes or until thickened. The sauce should coat the back of the spoon. If you put a little bit on a spoon and run your finger through it, the line from your finger should remain. Stir in the salt, garlic powder, and ground mustard. Return the remaining sauce to the stove. Over low heat, add the cheeses, stirring to melt. If you're unable to melt in all the cheese, add a bit more milk, a Tablespoon at a time, until the cheese is melted completely. Stir the sauce into the pasta until your desired level of creaminess is reached. I find I use all of the sauce sometimes and sometimes I have a little leftover. Taste and season with salt and pepper if needed or simply serve hot with a sprinkle of parsley. I recommend using large elbows, cavatappi, wagon wheels, or gemelli pasta for this recipe. For the cheddar cheese, look for a good quality aged cheddar, preferably aged over 9 months. I recommend Tillamook. For a milder, classic flavor and more yellow color, substitute 1/2 cup of the cheddar for 1/2 cup of yellow American cheese. For a bit of a kick, try subbing the Pecorino Romano for hatch chile or pepper jack cheese. You can also try Gruyere in place of the Pecorino Romano. Really liked this, was better when I re-heated leftovers. So second time baked it in casserole for 15 min at 350 after making on stove top. Yum!! I love a good homemade mac and cheese! This looks perfect! I live in western pa with my 15 year old daughter. I’m a native Texan, so when I saw this post on the BBQ at Cedar Point I nearly lost my mind!! Lilly and I were planning to go to Cedar Point this summer, but I had know earlier about the BBQ!!! Lilly is a mac & cheese fanatic but I cant get her away from the boxed stuff! It’s the ONLY processed food in our house! I threw out all that junk in January and we have lost a combined 60 pounds!! Wow! Congratulations on all your weight loss. 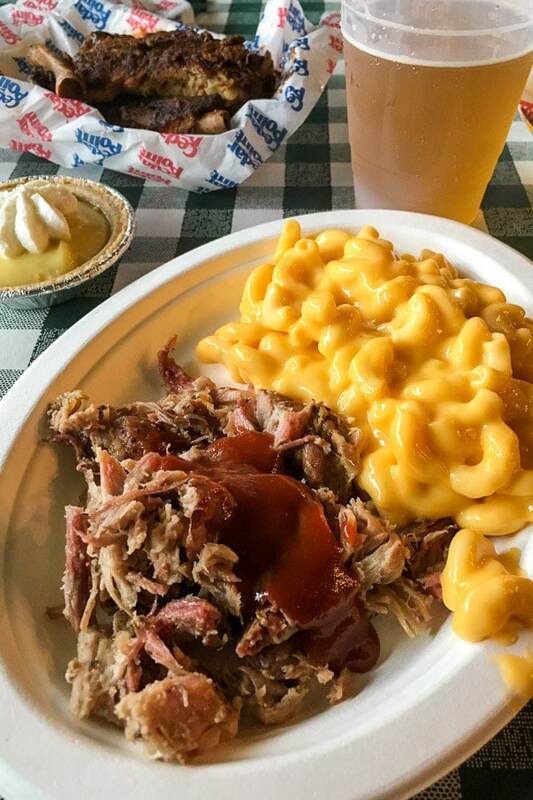 I think they’ll probably do the Brew and BBQ at Cedar Point every year, so definitely keep it in mind for next year, especially if you all are mac and cheese and BBQ fanatics! I thought this was bland. I used good cheeses so not certain why. Will probably add blue cheese to the left overs. I made this recipe today and was tasting the sauce as I went. I thought it was a tad bland as well to be honest, but I added some garlic powder, and that really made a difference! If you just add some spices that you like, I’m sure it would bump it up a notch for you! Thanks for sharing Megan! I definitely always advise tasting and seasoning as you go! I want to make this recipe for Thanksgiving but was wondering, did you really mean 16 oz of macaroni? It says it calls for 2 cups so that’s what I am guessing! Also, is there any alternative to use for mustard powder? Yeah 8oz equals one cup. I used 2 cups (16oz) of brown rice elbow noodles and it was just right! This turned out amazing, we didn’t even have leftovers! I used Tillamook extra sharp cheddar which turned out perfect. I’ll definitely put this in my recipe binder! Thank you so much for an amazing recipe. That’s awesome! Thanks so much for coming back to let me know. It always makes my day! I must thank you for sharing your recipe. Great news for my family. 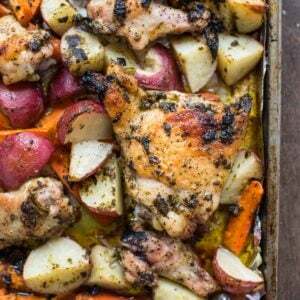 One pan without the breadcrumbs and one, my favorite with. Unable to photograph. It was gone in no time. There will be a next time. That’s great to hear! I’m so glad you and the family enjoyed it! I was looking for a good homemade mac n cheese recipe. We are used to southern East TN homecookin’. This mac n cheese was definitely creamy but lacked in flavor. I’ll use my husband’s grandmother’s recipe next time. My family was not a fan of this and I followed the recipe exactly as it was written. It is definitely different from the “southern” version we are used to. I’m sorry to hear you didn’t enjoy this Alana. If you liked the creaminess, I would recommend switching up the cheeses. Pepper jack is great if you like heat, American cheese will give you more of a classic yellow Mac and cheese flavor. Garlic powder or a pinch of red pepper flakes can really kick it up a notch too! Hope you find a recipe you love! I tried your Mac and cheese recipe! It’s really good and easy to make! I have also been trying to find different Mac and cheese recipes. Ones that ar creamy like yours. Though mines came out too thick? I guess to make it thinner consistency is to keep adding milk? Or too much flour? Kelly, I’m so glad you enjoyed this! if it seems a little too thick, you can definitely add a little more milk! Fantastic! My family loves it!! I added some more aged cheddar, and a bit of Cabot American cheese (deli), and the smoked paprika suggested by another reader- and everyone LOVES it!! Thanks for the recipe! So glad you enjoyed this! Smoked paprika is almost always a good choice! Love that hint of smoky heat! I made this tonight, very delicious! Will definitely use this recipe again. I used capavetti noodles. I would add more garlic and seasons next time. Finally found a recipe I like – added a bit of bacon & sliced tomato in the middle – family loved it! Can I substitute regular mustard? Yes! 1 tablespoon of mustard to every teaspoon of powdered mustard! I tried this recipe today and found it super easy to follow. The instructions were great. The final dish was creamy and tasty! So happy I tried this and would recommend to others. I used sharp Cheddar and the Gruyere. The gruyere sounds like a wonderful addition. I’m so glad you enjoyed this! So cheesy!! For my liking I’ll cut back on the cheese. But delicious. I love the cayenne pepper bite!! We just made this Mac and cheese. It’s absolutely perfect! 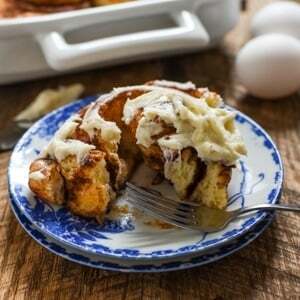 Thank you so much for sharing this amazingly delicious recipe! I think we may add bacon next time for fun but I always make new recipes as written the first time! It’s also a great way to use up all the extra cheese in our refrigerator! Thanks so much for coming back here to let me know! I also love to put whatever odds and ends of cheese I have in the fridge in this mac, and of course, adding bacon is never a bad idea! I would cut down on the garlic powder – esp if you’re serving it to kids. We thought it was too garlicky. Can I use salted butter and 2%milk? Yep! Just make sure to taste the sauce before adding salt. You might not need any with the salted butter! This is the best mac and cheese I’ve ever made. I have made a lot of mac and cheese recipes, and I’ve found one I stand by, but I started it wrong today and decided to look for a different recipe. I’m so glad I stumbled on this one! I learned the perfect bechamel method and got the absolute creamiest sauce with zero graininess. My one change next time might be to leave out a little of the garlic. Thank you! This is amazing! I made it today for the first time for a tailgate at our college aged son’s baseball game. I used 1-cup 2% mill and I-cup half and half (because it’s what I had in the fridge!) Also, the only cheese I had in the house was some fiesta blend shredded. Used it. Delicious! Wonderful! I’m so glad you liked it. Thanks for coming back to let me know! Wondering the yield of this recipe? How many servings does one pot make, and can this be made the day before an event and reheated in the oven the next day? ?